Plus: Updated ridership numbers and new info on the federal TIGER (aka BUILD) program. Here’s a fascinating-yet-nerdy transportation chart: How the length of time you feel like you’ve been waiting for the bus is impacted by the amenities of the bus stop. If your bus stop has shelter, seating, and realtime arrival information, there’s a significant impact on your perceived waiting time—reducing it by as much as 35%! Also interesting, although not unexpected, lack of amenities at a bus stop increases the perceived waiting time for women much more than men. The City of Chicago wanted to increase bus ridership and in an attempt to do so installed a clever combined bus lane / bike lane pilot program that turned out to be a complete success. Bus speeds went up 65% and now the city wants to try the experiment elsewhere. There’s been a lot written about the failed transit-funding referendum in Gwinnett County, Georgia as transit advocates and opponents process what happened. I enjoyed this opinion piece about the business benefits of public transportation that are no longer on the table for the county. Back in Richmond, we could use some of the region’s business leaders to step up and write a few things like this! We fall into the trap of trying to convince the community that transit and TOD are the answer, and then asking them to help us tweak the explanation and buy into the argument. The irony is that improved transit and greater housing choices are most likely what the community wants as well, but it’s the process of engagement, trust and partnership with local residents and business owners where we often fall short. Read the whole thing, but the above quote is especially pertinent to Richmond. We can do better, and, I believe, we (RVA Rapid Transit, GRTC, the region) are taking steps in the right direction. With the end of the 2019 General Assembly session, Richmond is now Virginia’s only major metro area without dedicated transportation funding, says Ned Oliver at the Virginia Mercury. Hampton Roads, Northern Virginia, and, now, Southwest Virginia have regional funding sources available for transportation projects—with Northern Virginia using some of that to build and pay for public transportation. Oliver gets into a bit of the history behind why the Richmond region lacks a similar bucket of funding and how we can get it. Senator McClellan underscores the importance of if/when Richmond has a similar funding mechanism that we use a portion of it to start building a truly regional public transportation system. Richmond Magazine’s Sarah King has a small update on bringing public transportation to Route 1 in Chesterfield County. The County has applied for a state grant that could pay for some sort of transportation service for up to three years. They’ll find out the status of their application later this spring. A constant question: How can we use the tools and resources we have on hand to improve bus service now without spending a ton of money? The answer is usually surprisingly simple: Bus lanes, transit signal priority, and other small changes to infrastructure that prioritize giving street space to buses. It’s not always about building a huge new transportation project, but, sometimes, it’s just about small, quick, and cheap improvements. Now this is neat and depressing: The Guardian has some maps of public transit systems in different cities comparing the street-car era to present day. Spoiler: We used to have lots more public transportation before the car ate America. If you live next to a bus stop, do you necessarily have access to useful public transportation? No! While proximity to a bus stop is an important factor in access, it’s certainly not the only thing that matters. Go read some more over on the RVA Rapid Transit blog about the other factors we should consider when we think about, talk about, and plan how to equitably expand our regional public transportation system..
Year-over-year bus ridership numbers for last month are out, and, whoa: Since last February, ridership has increased 23.8%! That’s incredible. The Mayor’s proposed budget contains $965,300 for GRTC to provide new and more frequent service, but what are the details? Who gets what new service? Well, wonder no longer, because, earlier this week, the Mayor tweeted out his plans for that new funding: A new route serving the new, under-construction grocery store at 25th & Nine Mile; extending the span of the #86 and #87 on the Southside to 11:30 PM; and adding Sunday service on the #2B. It’s been a while since I’ve linked to a deeply nerdy transportation article, but consider reading this piece about the details of electric bus batteries. It sounds like battery and charging technology still has some kinks to work out before we start seeing widespread, successful adoption in America. In battling climate change, electrification is important! But so is providing better transit service to shift trips away from single-occupancy vehicles. TransitCenter has a great piece about how public transportation can and should be a big part of the Green New Deal. A couple weeks ago, a referendum to fund and expand public transportation in Atlanta suburb Gwinnett failed. Now, just a handful of days later, Republican lawmakers have “crafted a last-minute amendment to an unrelated transportation bill on the penultimate day of the legislative session” to delay future MARTA referendums for seven years. Yikes. 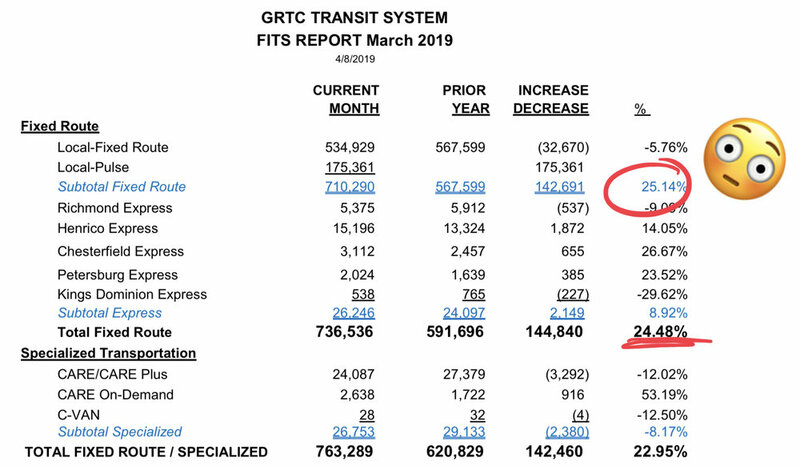 According to the Trend Analysis (PDF) and Monthly Motor Bus Ridership data (PDF) presented at GRTC’s March 19th board meeting, year-over-year ridership in February is up an astonishing 23.8%. Elsewhere, across the nation, bus ridership continues to decline—but not in Richmond. After years of disinvestment, the region is unlocking tons of latent public transportation demand simply by expanding and extending service—and we’re not finished. We’ve still got a lot of work to do to build a frequent, far-reaching, and equitable regional transit system. Mallory Noe-Payne at WVTF has a new story up about our regional public transportation system and asks Who is Public Transportation For?. If you asked me, I’d argue it’s for folks trying to get to work—especially those who can’t afford a car or can no longer drive. If you then asked me how I’d measure whether or not a person had access to useful public transportation, I’d talk to you about a lot of things—frequency, span, land use, and proximity to a bus stop. All of those things matter, and, often, we only talk about the very last one. Your bus only comes once an hour so you must leave your house two hours ahead of your shift or risk being late? You work nights but your bus stops running at 7:00 PM? Your bus route stops at the county line, two miles from your job, forcing you to walk the rest of the way? Your neighborhood lacks the sidewalks necessary to safely walk to the bus stop with your family? The short walk to your bus stop involves crossing a major highway without a safe pedestrian crossing? The nearest bus stops is a mile from your house? I’d say if any of those are true, no, you do not have access to useful public transportation. Richmond has a long history of strategically disinvesting in communities of color and lower-income communities—specifically when it comes to transportation. The entire region must do better (by funding transit at a humane level) and work to provide access to useful public transportation to all Richmonders. We absolutely should do this equitably—with a focus on restoring the connections in to and out of communities of color and lower-income communities. But as we think about, talk about, and plan how to equitably expand our regional public transportation system we need to consider more than folks’ proximity to a bus stop. In Henrico, the County Manager has proposed $465,000 to preserve and continue the new service that they launched this past September. At a recent meeting, the GRTC Board of Directors voted to restore some of the frequent, 15-minute service to Fulton’s #4A and #4B bus routes. This peak-only restoration of service will allow folks to get in and out of Fulton—on the way to and from work—much more efficiently and will cut the average wait for folks transferring from the Pulse in half. 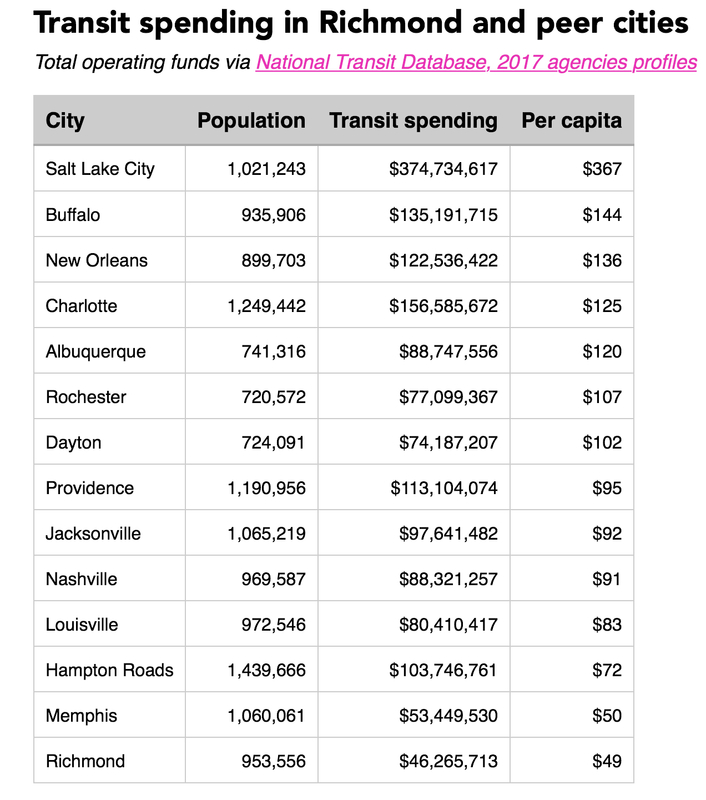 As our region scrapes together the pieces of the skeletal beginnings of a regional public transportation system, it’s important to remember that even with the influx of funding mentioned above, the Richmond region still spends less on transit per capita than almost any of its peer cities. This past week, Gwinnett County voters went to the polls and, unfortunately, rejected a 1% sales tax increase to expand public transportation into their region. The Atlanta Journal-Constitution’s editorial board says that “the changing politics and demographics of Gwinnett seem to guarantee that MARTA will eventually arrive.” Also in the AJC, a demographic breakdown of the vote and five takeaways from their quick analysis of the turnout. This week in transit: More money for public transportation! Monday March 17th is Transit Driver Appreciation Day! Without the operators, none of this works, so take a second to thank your driver when you hop aboard on Monday. The City’s Office of Community Wealth Building released their annual performance report (PDF) which contains this bit about the connection between high-quality public transit and employment: “Transportation continues to be one of the major barriers to individuals gaining and retaining employment. Although, the OCWB strives to ensure all participants are able to get to employment and training through our direct services we understand that the Richmond Area needs a comprehensive regional transit system that effectively and efficiently connects residents to employment opportunities. The development of a strong regional transit system continues to be a systemic goal of OCWB’s.” This, of course, is our goal as well, and we’re lucky that a plan for just such an effective and efficient regional transit system exists. While the recent and continued investment in public transportation by some of the region’s jurisdictions is definitely a start, to build a truly regional system we will need some bold leadership and movement towards creating a dedicated bucket of funding for just such a thing. Henrico County released their budget (warning: huge PDF) and joins Richmond City in increasing their funding for GRTC. They’ll chip in an additional $465,000 to pay for “a 3.0 percent increase in GRTC operating costs, and for a full-year of support of the mid-September 2017 service enhancement.” So while Richmond’s money goes towards new service, Henrico’s money will go to preserving the existing service (which is still pretty dang new). Between the two jurisdictions, GRTC will see about a $1.4 million increase in funding. Did you see this ridership trends PDF from GRTC? It’s kind of incredible. This past January saw a 26% ridership increase as compared to the previous January! After some back-of-the-napkin math that you should definitely take with a grain of salt, all of the recent investments in public transportation total a less than 10% increase in GRTC’s budget, but have kicked ridership up by 26%. That’s a significant return on investment. Gwinnette County, an Atlanta suburb, will hold a referendum this coming Tuesday to approve a one-cent sales tax to expand public transportation into the County. This would raise $5 billion to build and run heavy rail, Bus Rapid Transit, and more local service. Fingers crossed for those folks! Also in Atlanta, Mayor Keisha Lance Bottoms has decided to create a dedicated Department of Transportation for the City—something Richmond lacks but was one of the transportation-related priorities from Mayorathon.